The constant and breathtaking innovation in projection and display technologies is mind boggling and happening faster than the speed of light. The flexible, stretchable glass display technologies will surely impact the way we live our daily lives in ways we can’t even imagine — and , of course, the way we watch movies at home. 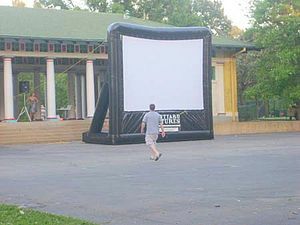 And then there’s the sort of loopy, fun — and my personal new favorite — the outdoor inflatable movie screen. Some are four stories high, and some can be used in your own backyard. Refreshingly opposite the high-tech screen, there are still ways to have your own in-home big screen by doing it yourself. YouTube has an array of videos on ways to craft your own screen on a super tight budget, by constructing one with canvas and pvc pipe to using screen paint on plain old drywall. Innovation thrives no matter where you are, from Silicon Valley to your own basement.